Chronicles of Nushy: [Rant] Devil's Canyon? Seriously Intel? Better thermal interface? Yes, Haswell does indeed run very hot when overclocked and the is 75% due to the crappy thermal interface these CPUs have with the die and the heat-spreader. The TIM is not bad, but the amount of TIM used in there is what seems to cause the issues. Why I said 75% is because the other 25% is due to the Fully Integrated Voltage Regulator (FIVR for short) introduced with Haswell. So with Devil' Canyon, that last 25% is still there. How much they have improved that first 75% is the question. Is it going to be soldered like SandyBridge and the former CPU were? Or is it going to have an awesome TIM like the Cool Laboratory Liquid Ultra? Who knows. But at least it is going to be good for people who don't want to delid the CPU to fix the thermal issue. But for people who have already delided their Haswell CPU, this is not a selling point. If the better thermal interface is the only thing that Intel is bringing to the table, then that is not going to affect many people. It is the voltage scaling that is bad with Haswell. This won't be fixed by putting a better TIM in there. Sure, you might be able to extract an addition 100MHz with a better TIM. But it is nothing noteworthy. 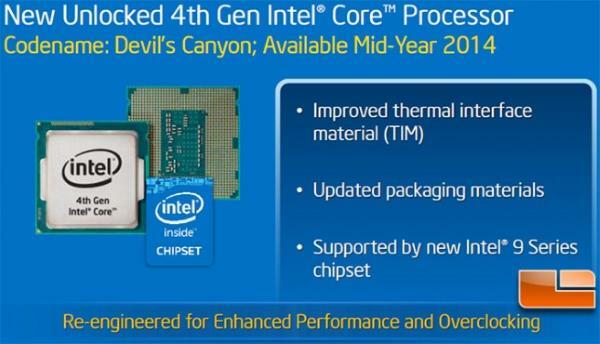 Unless you cannot easily hit 4.6GHz to 4.8GHz with these Devil's Canyon CPUs with 1.3V or below, they are not attractive enough. With 22nm CPUs, it is recommended that you keep the CPU Vcore below 1.3V. Sure, a lot of people go above that - especially the ones who have delided the CPUs, but they do that at their own risk. So basically, better TIM is not what people really want. They can already fix that by delidding. What they want is better voltage scaling. Give them 4.8GHz at 1.25V-1.3V and they will be happy. Heck, even I might upgrade to one, if that is the case. I hate my 4770K which only can do 4.3GHz.